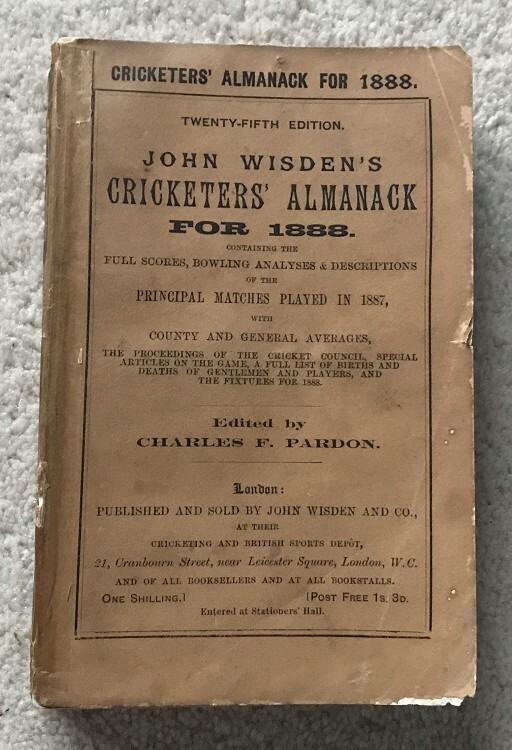 This lot is an 1888 Original Paperback Wisden. It is in Good Condition for the year. 87s & 88s are always darker than the rest of the book in their era, no idea why and this is the same , odd mark to the covers and small pencil marks to the base of the rear cover, decent enough covers for the year. A previous owner has added tape to the spine, it looks like clear tape and the spine and covers are the same colour however it makes the lettering to the spine a bit unclear. I m not sure it needs the tape as it is tightly bound with good hinges Nice clean pages , a diagonal crease , which is light runs from the front cover to mid way through the book but not off putting, odd mark to the odd page but very presentable inside. Less dark than normal for this year, ironically the first advert is F.Dark and son.